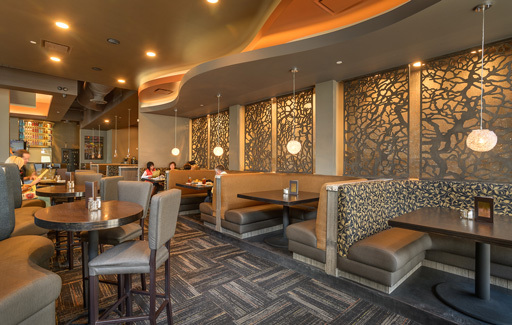 The design goal of Twigs Bistro & Martini Bar, located in the new Station Park Shopping Center, was to create an atmosphere that blended tall ceilings and an open space with a cozy, intimate setting. Warm colors, a mix of curved and linear ceiling bulkheads and decorative lighting throughout the dining area achieve the desired aesthetic. Movable glass walls that open up to an outdoor dining space maintain the open feel of the restaurant while providing easy connection between the exterior and interior dining areas. An exposed fireplace located in the center of the dining area contributes to Twigs’ combination of cozy and modern aesthetics. In the bar, cool colors and illuminated shelving visually distinguish the area from the rest of the dining space.